A women’s refuge run by Progress Housing Group in Chorley has received new flooring thanks to Preston-based flooring company, Gainsborough Flooring. The refuge, which was in much need of new flooring, has been supporting women and children fleeing domestic abuse for over 20 years. In July of 2015, Progress Housing Group took over the management of the refuge and since that time the refuge has provided emergency housing for over 38 families. Local charity Pauline’s Angels, decided to raise money for the new carpets and flooring and approached Gainsborough Flooring for a donation towards their fundraising efforts. It was then that the flooring company generously offered to donate carpets and vinyl to the refuge for free along with fitting the new flooring. Women’s refuges provide emergency temporary housing for single women and women with children who are fleeing from domestic abuse. At Chorley Women’s Refuge the women and families are able to stay as long as they need and are given their own bedroom and bathroom with bedding and towels. There is also a communal kitchen and lounge/recreational room which encourages the women to meet new friends. The refuge also has a room for children to play in. 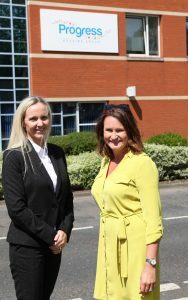 The picture shows Vicky Keelan from Gainsborough Flooring, on the left, with Lisa Crawford from Chorley Women’s Refuge.